STOP THE WORLD, MODERN ENGLISH ARE BACK! Eighties new wavers MODERN ENGLISH are set to return with a brand new album this Spring. The ‘I Melt With You’ hitmakers also have an extensive U.S. tour booked with U.K. and European dates in the pipeline. 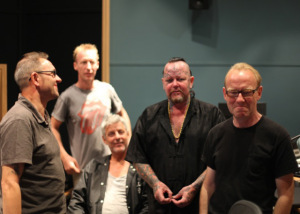 The as yet untitled album features original members Robbie Grey, Gary McDowell, Stephen Walker and Michael Conroy and is the first Modern English album to feature this line-up in more than thirty years. Recorded in a soundproof bunker at U.F.O. hotspot Rendlesham airbase in Suffolk, it was produced and mixed by Martyn Young of COLOURBOX. Set for a late-March release, it’s available to pre-order through PledgeMusic. Originally formed in Colchester, Essex in 1979, Modern English debuted with the classic ‘Drowning Man’ single before signing to 4AD. Second album After The Snow and single ‘I Melt With You’ in 1982 brought college radio and MTV-assisted Stateside success, while in the UK, Grey, McDowell and Conroy collaborated on 4AD’s THIS MORTAL COIL project. Although the band splintered mid-decade, they’ve reconfigured on a number of occasions, reuniting in 2010 with the original line-up minus drummer Richard Brown. In 2011, they re-recorded ‘I Melt With You’ for the movie of the same name. Full tour dates can be found here.